Well, that didn’t last long. 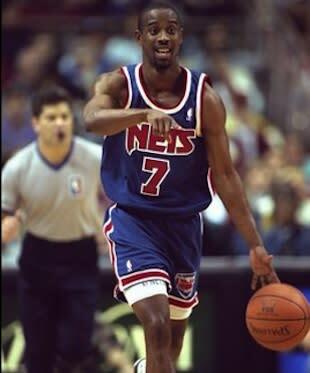 Less than two years after being appointed as head boys basketball coach of a local Jewish high school, former NBA star Kenny Anderson has been fired in the aftermath of an arrest for a suspected DUI. Anderson spent the 2011-12 and 2012-13 seasons serving as the head basketball coach at Davie (Fla.) David Posnack Jewish Day School, after being hired in September 2011. Anderson struggled to turn around the school’s fortunes, with Posnack finishing the most recent season with a woeful, 1-14 record. However, those on-the-court struggles weren’t the reason that Anderson was fired. Rather, he was dismissed because he was arrested not once but twice for driving incidents in which it is alleged that he was inebriated. On Saturday, Anderson was arrested and held on suspicion of DUI after being witnessed swerving erratically. In December 2011, the coach crashed his car into two trees, but was eventually not charged because he fled the scene. No one was injured in either incident. Yet the reputation of Posnack was apparently damaged enough to elicit an immediate response from the school, which issued a statement saying in no uncertain terms that Anderson would not be back leading the Posnack basketball program in 2013-14. “Kenny Anderson will not be returning as head basketball coach next season for the David Posnack Jewish Day School,” Posnack Athletic Director Danny Herz wrote in a statement that was obtained by Miami-based website Gossip Extra. There’s no word on what Anderson expects to do next, but the area will almost surely reflect on his time at Posnack as a true curiosity. The former 14-year NBA veteran has no direct ties to Judiasm, and his appointment appeared to come out of the blue. At the time, Posnack officials expressed astonishment at their luck at landing such a notable basketball name. Anderson’s hiring generated excitement and attention for the tiny Florida school, all while giving Anderson an unexpected platform on which to build his coaching career. Based on his track record, it now appears he won’t be building up much of a career beyond the Florida small-school private level after all.